A small and historic port city at the base of the Iron Range, Duluth’s harbor is the hub of Minnesota North Country, sending iron ore and local farm products to markets around the world. Its five-story Enger Tower, built of local Blue Stone in 1939, stands guard over the port that was, for a time, the busiest in the country. In recent years, Duluth’s industrial character—old stone buildings, red brick streets, slate roofs—has become the basis for the city’s second life as a tourist hub of the region, with its once-bustling factories and warehouses being remade into music venues, breweries, distilleries, and small-scale manufacturers of trendy high-end goods. It’s a historic preservation success story and a fine place to grab a beer, listen to some live music, and soak up the charms of Lake Superior’s lakefront. To give you an insider’s look at the city, we asked the locals what to do when you visit. Here are a few favorites. Bob Dylan’s hometown is a surprisingly swinging small city. For a live show nearly every night of the week, The Red Herring Lounge—the 130-year-old former fish company building—is a retro-styled cocktail bar with well-worn wood floors, exposed brick, and a local following. For occasional big, ticketed events West Duluth’s Clyde Iron Works is housed in a massive, 11,000-square-meter (36,000-square-foot) former steel foundry that’s been transformed into a restaurant, bar and venue in a cavernous space that honors its industrial heritage. And, during the warm months, the waterfront Bayfront Festival Park hosts annual book festivals, beer festivals, and lots of live music, including some big-name acts. But it’s Sir Benedict’s Tavern on the Lake—known to locals as simply “Sir Ben’s—that many Duluthians call the “most chill place in town.” They love the outdoor seating in the summer and the bar’s open piano, where someone is always willing to take a turn at the keys. Live music starts every day at 5pm, but jam sessions can break out at any time. Bring your favorite instrument and play along, or sit back and take it all in! Among Minnesota’s distinctive food traditions is the state’s love affair with the “hot dish.” A staple of home entertaining and potlucks, the hot dish is just another name for a casserole—a hearty one-dish meal, baked in the oven, and perfect for feeding a hungry crowd. The Rambler food truck (their slogan: “Roam. Eat. Repeat.”) serves a contemporary take on the concept, called “tatchos,” which is a mash-up of nachos and tater tots, with plenty of cheese, plus black beans, jalapeño, sour cream, pico de gallo and guacamole. Locals “hunt them down” wherever the Rambler roams. The up-and-coming Lincoln Park Crafts District is a formerly industrial area that has exploded with new businesses—breweries, restaurants and “makers,” including the Duluth Folk School, which offers classes in everything from eco-friendly silk screening to soapmaking to chainsaw safety. Nearby, Frost River manufactures high-end canvas “canoe bags,” satchels, pack baskets more using Minnesota leather and waxed canvas from high-quality, old-school tanners and textile-makers. These new-school manufacturers take craftsmanship seriously, but it’s all in the service of a good time. Locals suggest a visit to Canal Park, a lakefront area near downtown that’s connected to the 11-kilometer-long (seven-mile) Minnesota Point—the world’s longest freshwater sandbar (known locally as “Park Point”)—by a unique 1905 aerial lift bridge. For an impressive beer in an equally impressive setting, head to Hoops Brewery, where longtime brewmaster for legendary local brewery Fitgers branched out and opened his own passion project, a nouveau beer hall in a historic 1889 building on the shores of Lake Superior. Down the street, the Northern Waters Smoke Haus offers house-made smoked fish—from salmon to whitefish—and cured meats, including bison pastrami. Try the Northern Water sandwich, featuring the deli’s smoked bison shoulder braised in Schlitz beer. For something else straight from the waters of Lake Superior, Vikre Distillery is a mom-and-pop distillery and cocktail lounge in an old lakefront warehouse. Sample four of Vikre’s (Pronounced: Veek-Ruh) spirits in a flight or try them mixed in a complex cocktail featuring Minnesota-inspired liquor like Vikre’s Boreal Spruce Gin or their highly-praised Aquavit, the quintessential Scandinavian liquor. 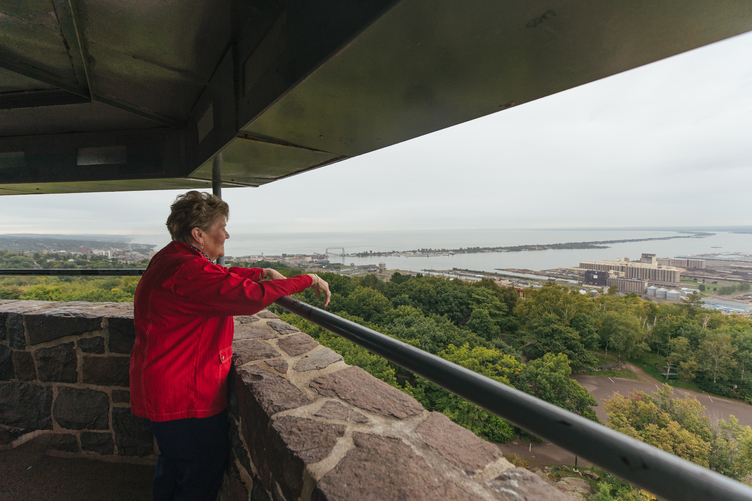 “We love to collaborate in Duluth,” say locals. And that spirit of a shared purpose is everywhere—from the snack plate at Vikre’s, which is prepared with products from Northern Waters Smokehaus, to Duluth Coffee Company and Bent Paddle Brewing, who have come together to make an intriguing cold-pressed beer. At Sara's Table Chester Creek Café collaboration takes another form: this beloved farm-to-fork restaurant serves delicious tastes-like-homemade dishes three meals a day using heritage pork products from a nearby farm and nurturing a small farm/community improvement project, Chester Gardens, in a lot kitty corner to the restaurant. It takes a village!